Royal Enfield, the popular South India-based motorcycle manufacturer, has released three brand new TVCs of the Himalayan adventure motorcycle. These videos go on to highlight the highly versatile nature of the only adventure motorcycle in the company’s line up. The first of this three TVC series shows the Himalayan speeding through an arid piece of land. Basically, the video shows two Himalayan motorcycles being ridden at decent speeds on a sandy surface. The video aims to demonstrate that the Himalayan can be easily ridden on all sorts of surfaces, with its long-travel suspension, powerful engine, and dual-purpose tires helping it easily deal with the challenging terrain. The video concludes with “Built for all roads, Built for no roads” tagline. The second video in this series of TVCs shows two Himalayan motorcycles riding on some smooth tarmac. The video shows the Himalayan being ridden at fairly high speeds on a multi-lane highway. It also shows the motorcycles riding on a fast, winding, divider-less road. Basically, through this video, the company wants to highlight the long-distance touring capabilities of its adventure motorcycle. Thanks to a comfortable saddle, well-tuned suspension, sorted ergonomics, and a punchy motor, the Himalayan is among the best mile-munchers in its price segment. The third video shows a couple of Himalayan motorcycles being ridden on a narrow, dusty road in a hilly region. The video then goes on to show the motorcycles travelling through some rocky patches and even through a grassy stretch of land with no tarmac in sight. Once again, the company wants to highlight the versatile nature of the Himalayan through these videos. 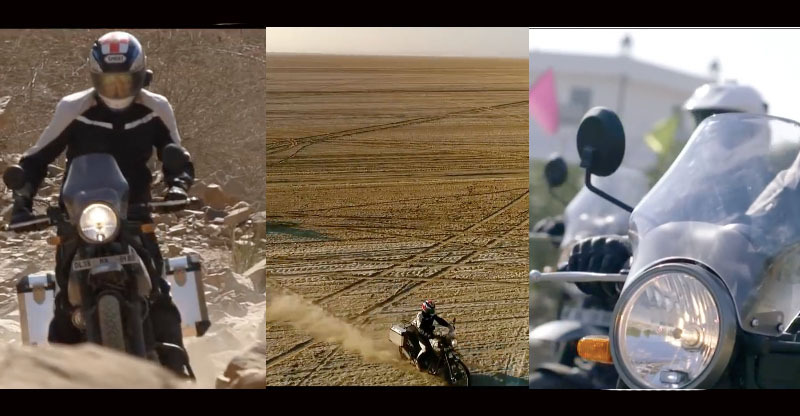 The Himalayan motorcycles in all three of these videos have been kitted out with a couple of panniers, which is again something that hints at the company’s aim to attract long-distance tourers. Like we’ve always maintained, the Himalayan is the only real adventure motorcycle in its price range. Its punchy motor, along with well-sorted ergonomics and a purpose-built suspension, makes it a very good option for all those looking for a rugged and very capable long-distance tourer.